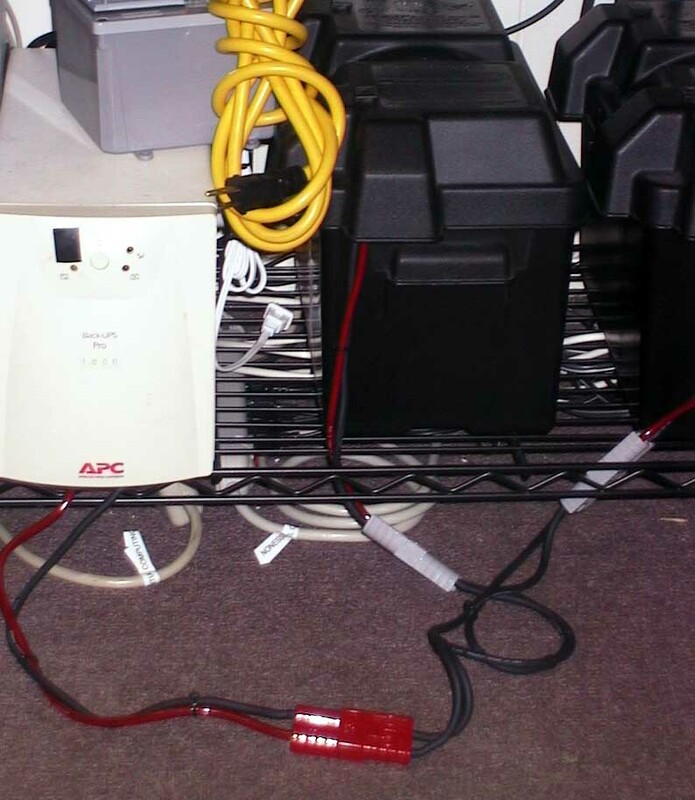 UPSes are a great source for really cheap power inverters. How cheap? How does a real 1000VA continuous inverter for $49 sound? A UPS is nothing more than an automated system containing a power inverter, battery and battery charger. These can be used to power mission-critical loads while an alternate power supply is being set-up, and during times when the alternate power needs to be directed to mission-critical systems. However they require a few modifications to accomplish this mission during a blackout. 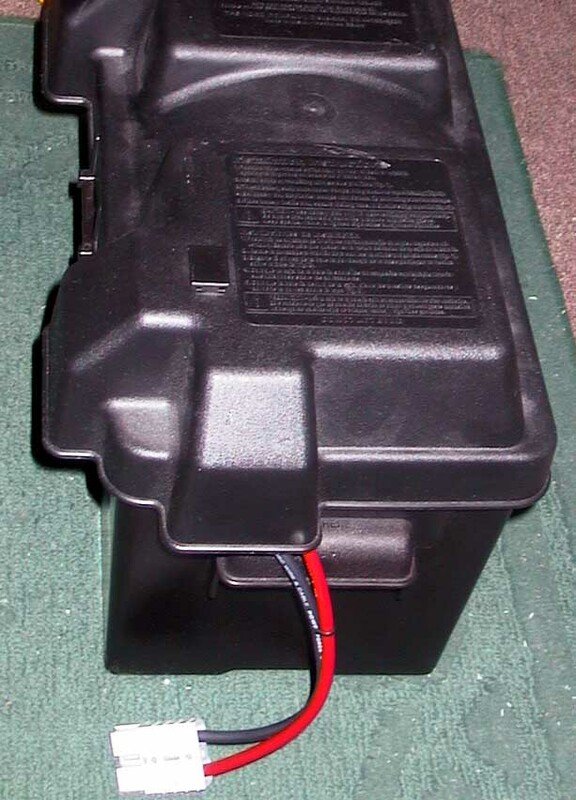 UPSes contain an alarm that sounds the whole time that the UPS is running on battery power. Some of the more expensive UPSes allow the alarm to be permanently silenced. Others require a modification to accomplish this. UPSes were designed to run at full-load for 5-10 minutes (until the small factory battery runs out), not continuously. In order to run them for extended periods of time, some additional cooling is necessary. The batteries that ship with the UPS are really inadequate for emergency power usage. They're designed to power a computer for 5-10 minutes until it can be shut down safely. The UPS can't be modified and still have that great $50,000 warranty apply. I'll show you how to get around this, too. This is nothing more than a small SPST pushbutton on/off switch wired in series with the speaker inside the UPS. It requires some soldering skills and drilling a hole in the case to mount the switch. Locate the speaker inside the UPS - this is usually a 3/8" diameter cylinder about 1/4" high that has a hole in the top of it. Note the position of the positive terminal of the speaker and then unsolder it. If you don't ever want to hear the alarm again, you're done! Otherwise, drill a hole in the case and mount the switch. Solder the switch in series with the speaker using small (24ga is good enough) solid hookup wire. Reattach the combination switch/speaker to the PC board of the UPS, making sure that the positive terminal of the speaker connects to the same terminal it was connected to before you started making changes. I found an energy-efficient fan at Radio Shack. It was powered by 120VAC and was the exact size needed to attach to some cooling holes in the side of the APC BackUPS Pro 1000 case - I didn't even have to drill holes. I had to attach a lamp cord and plug to the fan wires. Since the fan is fairly noisy and the inverter is usually off (when grid power is available to the UPS), I just leave the fan unplugged. When a blackout happens, I plug the fan into an outlet on the UPS. In the future, I plan to add a relay to sense when the UPS is running on battery power and switch on the fan automatically. It turns out that the batteries used by all my UPSes are 12 Volts, the same as large trolling motor batteries available at Walmart. Some of my UPSes require just one 12V battery, and some require 24V, so I used two batteries in series. 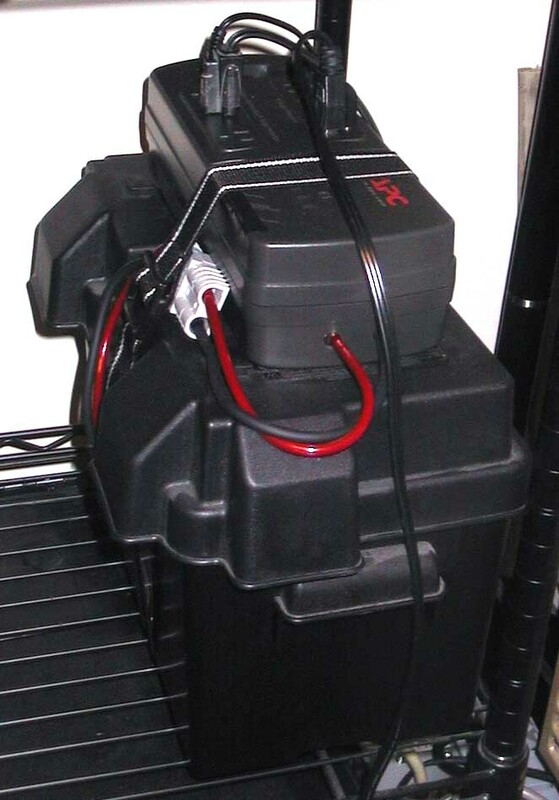 The run time for the inverter can be tremendously increased by replacing the standard UPS batteries with deep cycle (trolling motor) batteries. Instead of 12AH batteries, I now have 115Amp Hour batteries. This multiplies the run-time by a factor of 10! At full-load, I can get 4+ hours of run-time on battery power alone. With more conservative usage, it will run 24hrs or more. Important! Only use batteries marked "Trolling Motor" or "Deep Cycle". Other batteries, such as car batteries, lawn and garden batteries and Marine Starting batteries can't be fully discharged multiple times without being damaged, so don't use them. See the Batteries and Chargers page for more information. Of course the trolling motors won't fit in the UPS case, so I use battery boxes to keep the dust off them and to contain any leakage from the battery. These are available at Walmart in the sporting goods section for about $5. To connect the batteries to the UPS, I use large wire (8ga) and keep the wire length as short as possible (<3ft). I also wanted the ability to move things around and switch any of the batteries to any of the UPSes, so I installed Anderson Power Products (APP) SB-50 connectors on everything. These are the large connectors used by forklifts and other electric vehicles. I bought the 50A ones - they're large enough for use with the high-current inverters that I have (APC BackUPS Pro 1000s which draw 42A at full-load). The connectors are symmetrical - they plug into another identical connector and in doing so, maintain polarity - they're even marked '+' and '-' to keep everything straight. Then to connect the batteries to the UPS, I made cables using 8ga wire with an SB50 connector on one end and quick disconnect terminals like the factory battery had on the other end. To connect two batteries to get a 24V supply, I made a cable with three Anderson connectors in series (Plus terminal to the minus terminal of the next connector and repeat). This lets me connect two 12V batteries to my 24V inverter. To keep everything safe, I installed a 60A fuse and fuse holder designed for use with car audio applications. They're also available at Walmart or Radio Shack. The battery charger built into the UPS does a great job of keeping the batteries charged, but I wanted to be able to charge the batteries with a deep cycle battery charger I have (it's faster than the UPS charger), so I cut the battery charger output cord and soldered in an APP SB50 connector pair. This allows me to disconnect the batteries (while the UPS is on grid power), charge them individually, then reconnect them without losing power. This also provided a pair of alligator clips attached to an SB50 plug, so I can take along an inverter and use it while camping or away from the house. See the Batteries and Chargers page for more information. No doubt you'll void the UPS warranty when you make all these mods to the UPS. Since some people avoid making these modifications, I've come up with a solution. Go out and buy a power strip or surge suppressor with a similar warranty that says it covers everything attached. Then plug the power strip into the wall or wall switch box, and plug the modified UPS into the power strip. I haven't tested this, but it'll probably work. APC inverters are extremely conservatively rated. My 10 year BackUPS Pro 1000 (available used on EBay for ~$49) is rated for 670W and 1000VA, but I've connected a load of 1.9KW (my computers, entertainment center, refrigerator, a 20" industrial fan and my window AC) to it, and it did fine. Voltage didn't drop at all, and current was measured at 15.8A. When even more load was added, an internal breaker tripped, but the UPS was still going strong. If you're interested in efficiency, choose the inverter with the highest battery voltage you can find (some of the APC 2200s and larger UPSes are 48V inverters). This will minimize losses in the cables connecting the batteries to the inverter, but will require more batteries, which increases the cost. 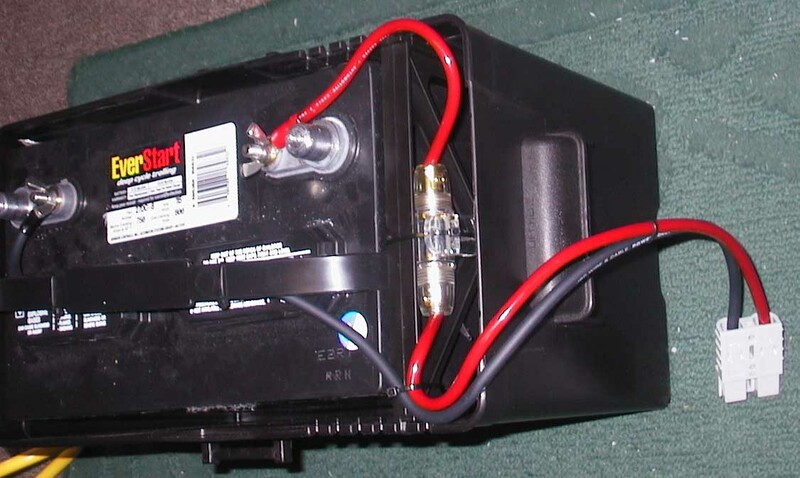 If you're interested in being cheap, choose an inverter with a 12V battery voltage. This will minimize the number of batteries you have to buy. APC ES500 UPSes work great. They're $59 new, they're small and lightweight, and they can be easily modified with the above modifications. This UPS can also be fed directly with the 12V output that some generators contain. This documentation is a part of a larger project called the Emergency Power Distribution System. During a power outage, loads can be supplied by a generator when the generator power isn't needed, and can power the loads while the EPDS is being configured, and can be used to power loads that are shed when the generator is powering high-power loads. See the Energy Efficiency Comparison Chart (or as an Excel File) for more information about how electricity compares to other forms of energy consumption. Below 10% of rated load, efficiency approaches zero. At 10% of their rated load, commercial inverters are about 85% efficient. Above 30% of their rated load, commercial inverters are about 92% efficient.